The Victorian Fashion continued to make a head-go in the coming months’ after the 1850s. The Bustle Dresses became immensely popular. 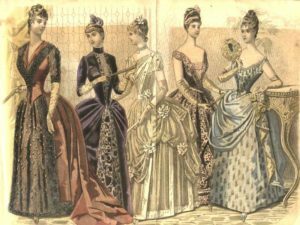 Most of the contemporary Victorian Women preferred to grace and adorn themselves with highly adorned Victorian Bustle Gowns. How did Women Wear Hoop Skirts? 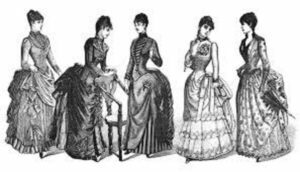 In 1856, Jacket bodices became quite popular. The Evening necklines became deeper and came down, showing the cleavage and neck. The day dresses had bell sleeves which covered the shoulders. This may be to protect the arms and shoulders from heat and sun. The gowns from the bottom became even more flared and heavy. The layers inside of the gown which was made up of satin, cotton, silk and thorough padding became thicker. The Bustle Gowns, in The Victorian-Hoop Era starting from the 1850s, were round and wide at the bottom. They were comfortable, stylish and highly ornate. These were heavy and consisted of 3-4 inner layers, to make it wide and sassy. Bustle dresses came in very rich colors. For Example-crimson, red, purple, blue. Darker hues were preferred for evenings. The Gowns became much more well-defined in terms of shapes and fitting. These were now accompanied by stylish accessories. Women during the Victorian Times were extremely fond of accessories like umbrellas, hand fans, head gears- hats, masks, laced face coverings which were tied at the back of the head. The hoop skirts that ladies wore under the Bustle Dresses replaced the crinolines in the mid-1850s. In design and function, the hoop skirts were very similar to the 16th- and 17th-century Farthingale and to 18th-century Panniers. The HOOP ERA BUSTLE Gowns were easy to wear and could be either worn from the top or like a skirt from the bottom. They were tied at the back and zipped or tied with a long lace to the side on the waist. Hoop Skirts were layered with Crinolines and frills. A hoop skirt was an undergarment which was worn beneath the gown to hold the dress. The ladies who wore them were kind of heroic. A crinoline in the Hoop Era was a stiffened and structured petticoat worn beneath the gown. 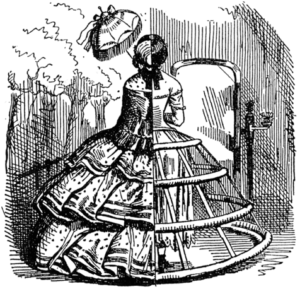 By 1850s, crinoline came to be known as the fashionable silhouette provided by horsehair petticoats. The Hoop skirts and Crinolines were very useful and enabled the Bustle Dresses to spread even wider and more fully. Tight corsets, plunging necklines, heavy Bustle, gigantic hoop-skirts were in fashion. Women wore layers and layers of crinoline and horsehair to give the fuller look. To support the Bustle gowns and the hoop skirts, the right type of lingerie and undergarments were an absolute must! These were generally white and skin colored and were worn under the gowns to give the dress a fuller and complete look. These were body fitting, tight and came in various designs. Generally made of cotton and satin, they were worn to accentuate the figures. The Bustle Dresses accompanied with heavy and embellished accessories denoted the high fashion and materialistic culture of the Victorian Age. The fashion sense was unparalleled and is copied even today!